The Daily Digress: Je t'aime et je soufflé. Je t'aime et je soufflé. Are filthy jokes filthy if you have to speak another language to get them? Just asking. My children love soufflé and they like to eat early. Ergo, no one above the age of nine is ever home to see the soufflé before it falls. And, you know what they say, if no one is there to see the risen soufflé, did it still rise? So, I have to take a picture. I firmly believe that when you are taking a picture of food, it should look as much like a seventies cookbook as possible. The colors should be garish, the floral arrangements loud or holiday themed and liquor should be prominently featured. Everyone loves a glass of Dewar's with smoked salmon soufflé, right? 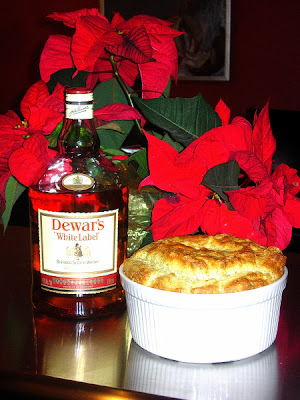 Incidentally, I like how the Poinsettia looks as if it is both lovingly cradling the Scotch and preparing to devour the soufflé. It looks so alive! It's like a metaphor for the soufflé, which is sort of alive, because it falls as soon as you stab it. I just love violent food imagery, don't you? 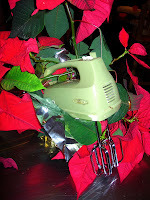 I like how the mixer seems to be coming out of its Poinsettia hiding place. That souffle looks amazing - I am so impressed!